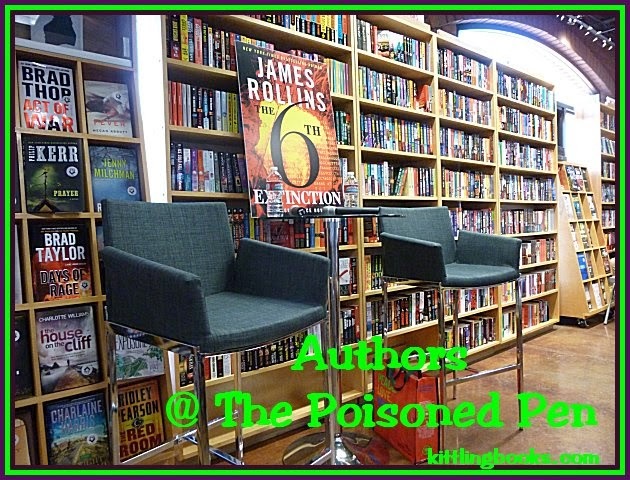 Jeffrey Siger and Timothy Hallinan at The Poisoned Pen! This was probably the best day I've ever had at my favorite bookstore, The Poisoned Pen, because authors Jeffrey Siger (creator of the excellent Andreas Kaldis series set in Greece) and Timothy Hallinan (creator of two more absolute favorites Junior Bender and Poke Rafferty-- set in Los Angeles and Thailand respectively) went out of their way to treat me a bit like royalty. I've talked about the evening already, so I'm not going to rehash it; however, I just thought it was amazing that-- during a week when the blogging world has blown up over their relationships with authors-- I had an experience that was the polar opposite from the example being used. In fact, almost every single experience I've had with authors has been overwhelmingly positive. This leads me to believe that what I put into something is generally what I get out of it. I could say even more, but this recap is for two very special, very talented writers, and has nothing to do with me, so I'm going to make two more comments then get on with the show. One-- the icing on the cake of this evening was when I also got to chat with yet another favorite writer, Donis Casey (creator of the Alafair Tucker historical series set in Oklahoma) who sat down by me. The second and last comment is a word of apology. Due to a last second chair shuffle, I was not sitting in the optimal location for photos, but I gave it the old college try! 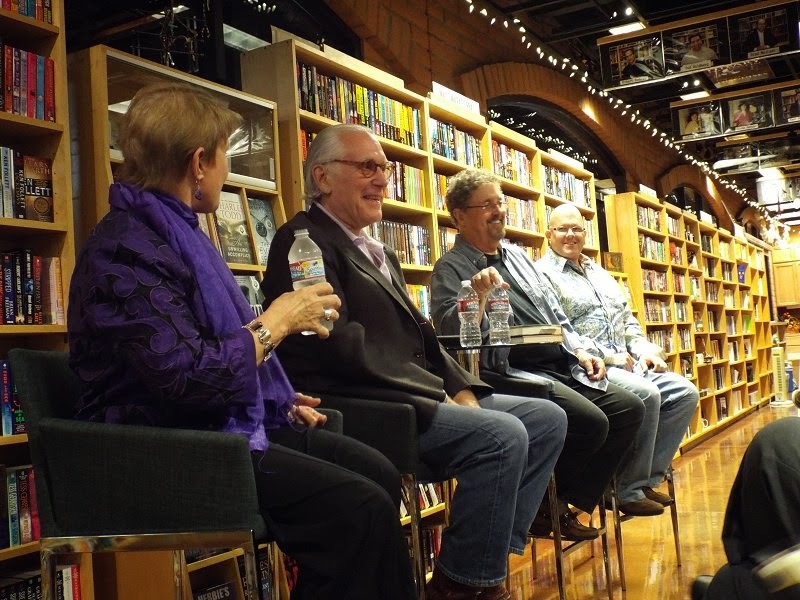 For this event, host Barbara Peters and the authors were joined by Arizona Republic journalist Robert Anglen. When Barbara asked Robert if he wanted to start first, he deferred to her. Jeff immediately said, "Wait! There are two of you asking questions?!?" to which Tim replied, "This is like being in parentheses!" There's nothing like starting off the evening with a laugh, is there? Barbara began by saying that Siger and Hallinan are friends and blogmates, and I can honestly attest that the blog they contribute to-- Murder Is Everywhere-- is one of the best ones going. 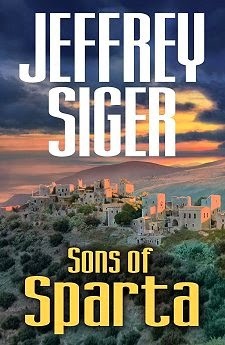 She also mentioned the fact that Siger's latest book Sons of Sparta is dedicated to the founder of Murder Is Everywhere, Leighton Gage, the writer of the marvelous Inspector Mario Silva series set in Brazil. As Tim said, "We'd all like to think that really good writers eventually get their due, but I don't think Leighton got his. He was one of the best writers of the last fifteen or twenty years, but he never got his breakthrough book. He was a terrific writer and a wonderful guy. If his books are here, get them. They're excellent." With her fingers on the pulse of publishing, Barbara was able to tell us that Tim's publisher, Soho Press, now has their books distributed through Random House and that Gage died before his books could benefit from the greater exposure. Peters then began to talk about Siger, a writer who's published through her own Poisoned Pen Press. He's a bestselling author in Greece, which is a bit surprising since his books are critical of the country's government. "Jeffrey is a lawyer who made his bundle, sold up, and moved to an island in Greece," Peters said. "I've threatened to kill him if he leaves us for another publisher, and he's told me, 'And what would I do? Sell up and move to an island in Greece?'" Siger said, "I wrote the first book and people liked it, so I decided to stay with these characters. Readers like it when the characters say critical things about Greece, but they'd probably hang me if I said them. The first one was about Greeks and their economy. The second was about Greeks and their government. Then there was Greeks and the Church and Greeks and immigration. This newest one is about Greeks and family. I keep writing 'em, and no one's shot at me yet. And they're translated into Greek by the way!" Barbara pointed out to Siger early on that, although he was writing contemporary crime novels, he was also echoing ancient Greek culture. "I've been told that before," Siger said. "I was telling Tim at lunch that someone I like a lot compared me to Euripides. I really don't see it, but people point it out to me." "I'm talking about themes-- like hubris-- that have come down through the centuries," said Peters. Siger then proceeded to give us a bit of background into the Mani-- the area of Greece in which his book is set. It is rumored that the ancient Spartans didn't die out and disappear, rather they found sanctuary at the bottom of the Peloponnesian peninsula-- the Mani. The landscape is harsh and unforgiving. The people are proud of their pirate ancestry, their warrior ancestry. It is a brutal land in which there is a long history of blood feuds. "I wanted to write a book about this part of Greece," Jeff said, "but I couldn't come up with the right theme. One day at a convention I had a fan come up to me and say, 'I have a story about my family that should be a book!' Now... how many of us have heard stories like that? But I'm polite and ask her to tell me the story. "A young man studying medicine in Athens gets a call from his father to come back to the Mani. He goes back and is in a room with his sister, her boyfriend and his father. His father says, 'My daughter is pregnant by this man. I want you to kill your sister, and I want you to kill this man who's responsible for your sister's disgrace.' The young man does as his father wishes. At the trial just before the judge is about to pronounce the verdict, the judge's mother stands up and says, 'Before you pronounce judgement, remember that you did the very same thing to your sister for the very same reason!'" 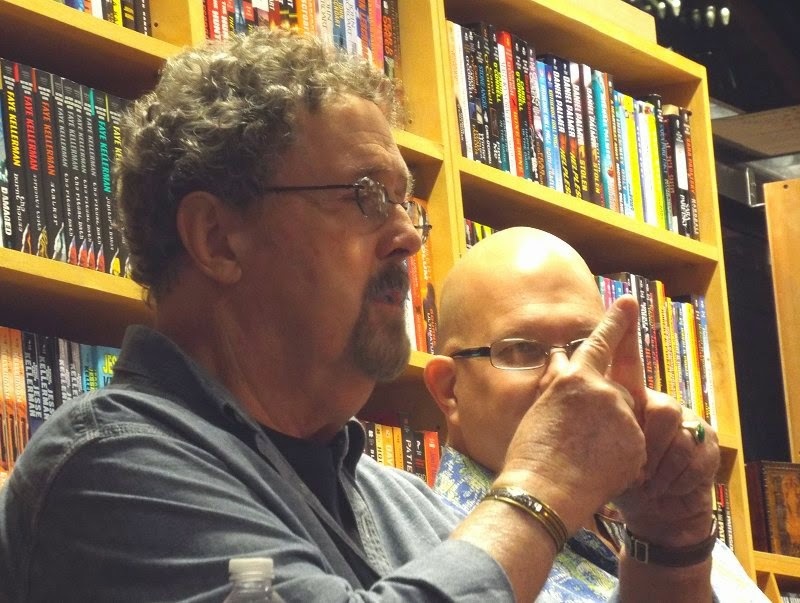 "...because she's waiting for me to..."
Robert Anglen then began to interview Tim Hallinan. "You've been writing for twenty-five years. 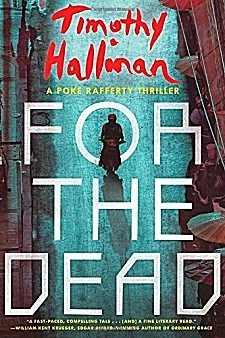 You've written several series, but nothing quite like this Bangkok series. What I cued on in this book [For the Dead] and the entire series is this sense of family. You write about this despicable place that you perhaps love, but you imbue it with this sense of loyalty and honor, and I'm interested in that." "It's been a process," Hallinan replied. "I went to Bangkok by accident in 1981. I fell in love with the place. It's the most cheerful big city in the world despite all the awful stuff that goes on. Bangkok is like New York City with smiles. "Initially I wanted to write about Thailand. Because it's a very deep and complicated culture. The hierarchies are as stratified as the Grand Canyon. I was so smart. I decided that the first scene in the first book I was going to write would show my main character holding the hand of his adopted daughter as he followed his wife down the street as they go grocery shopping. "But what happened as I kept writing was that dynamic between this woman who started as an unworldly country girl who was forced through no choices of her own to work in a bar in Bangkok, and this little girl they adopted off the street who was a discarded child, and this American travel writer who's been everywhere looking for a place that feels like home and has finally found it... they're in a relationship which each of them knows is probably their last chance to have a whole life, a happy life, but they are miles apart culturally. So as the books have gone on, I continue to write about Thailand, but the focus has come to bear on the very complicated relationship between these three people. "I have to admit that I've fallen head over heels in love with the little adopted girl, Miaow. From the second book, Miaow was the easiest character for me to write. (In the next book-- which is called The Hot Countries-- Poke finally learns exactly how Miaow was abandoned.) This young girl always has an agenda. This is a child who was completely powerless for the first five years of her life. Now she's thirteen, but she still has control issues. It's very easy for me to write her because I know what she wants. She's developed all sorts of physical tics, and it's because she's waiting for me to think of what the other character is supposed to say next. "This book is Miaow's book. It's about what happens to a very vulnerable adolescent girl, riddled with self-loathing, who has her invented persona literally ripped away from her-- and who then learns that her adoptive parents are going to have a child of their own. Where does she go? What does she do? "I love this child. I never had a daughter. I don't have sisters. I have a thirteen-year-old Thai girl living inside me," Tim said. I find that extremely easy to believe simply because Hallinan is so animated, so passionate, when he talks about this wonderful character he's created (and because Miaow is so alive when I read about her). In a previous book, Rose and Miaow were in danger, and Poke sent them someplace safe. They will still face danger from time to time, but Hallinan is avoiding hiding them offstage when the going gets rough. When Anglen asked Tim about the fact that Poke is part Filipino, Hallinan admitted that the reason why that came about is that he wanted Poke to be able to blend in a Thai crowd if he was in danger and on the run. "I thought it was going to be important in the series, but it isn't," he admitted. Anglen could see Poke's being half Filipino as a tough sell with American publishers who like "cookie cutter heroes." "This is an exotic," Hallinan said. "Exotics [books set outside the U.S.] aren't supposed to sell, and in fact they've lived up to that. They haven't sold well. People like them, and they like them a lot; they just haven't sold well." "But you've had fabulous critical success," Barbara pointed out. 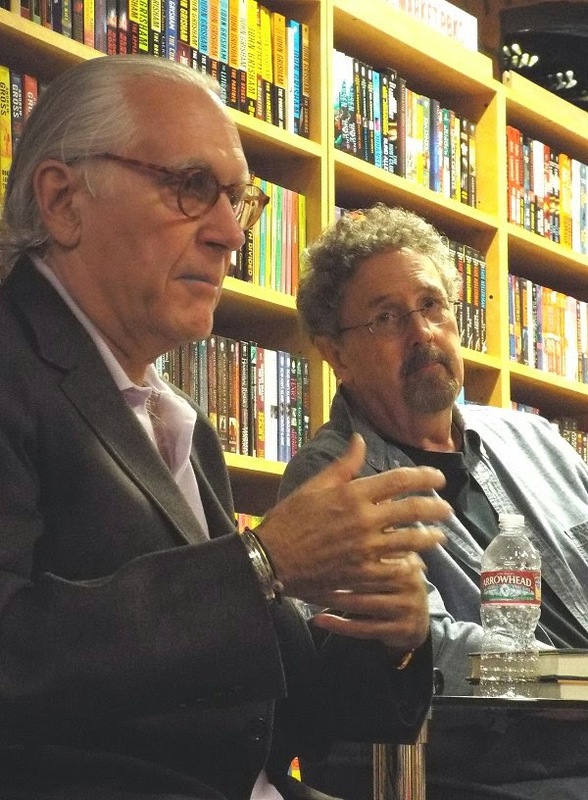 "Yes, I think I got one of the last huge advances HarperCollins ever gave out," Hallinan said. "They let me go after the third book came out, and the day after they let me go, that book was nominated for an Edgar Award! They called me up, and I said, 'It's too late, I've already gone with Soho!' In fact I think you [looking at Barbara Peters] were the person who suggested that I go with Soho." "They were perfect for you," Peters said. "Soho likes exotics-- foreign settings-- it's almost their policy, although they're changing a bit and becoming more general." 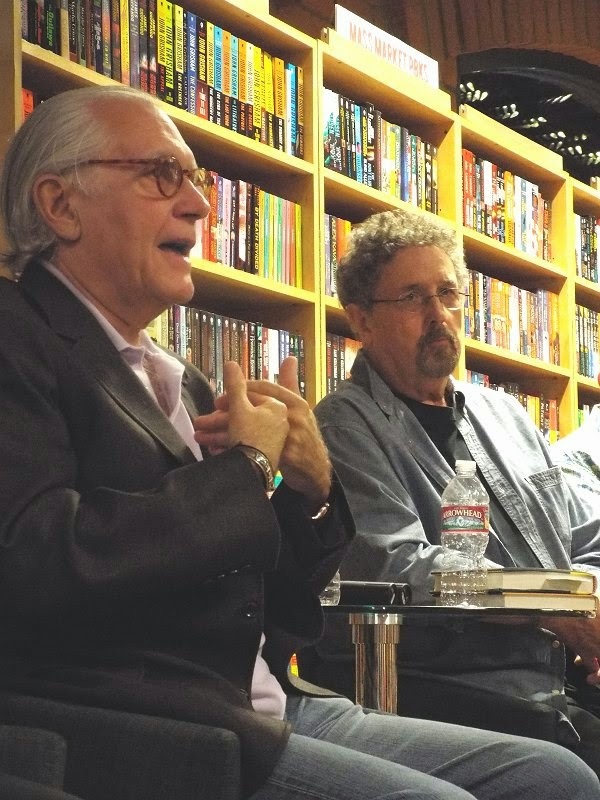 "My Junior Bender books are the first ones Soho has published that are set in the United States," Tim commented. "Yes, you're channeling Donald Westlake when you're not channeling a thirteen-year-old Thai girl," Barbara commented. "What an interesting place inside your head!" "Eddie Izzard has bought the Junior Bender books for NBC, and we're crafting the pilot now," Hallinan said. "We'll know in a few months if there's going to be a series or not." "Let me just say this," Barbara said, leaning toward Tim, "if you let yourself get caught up with him and abandon Poke and Miaow, I'm coming after you!" After talking a bit about the current government in Thailand-- and saying a thing or two that would get Hallinan thrown in prison if he were there-- conversation turned back to Jeff Siger and Sons of Sparta, which focuses on a member of Inspector Kaldis' team. "I love women," Siger said, "I respect them, so I try to bring them in as characters because they always express a side that you can't get in a man. My favorite line in My Big Fat Greek Wedding is 'If man is the head, woman is the neck.'" In writing the book Siger decided to try his hand at writing a form of unique 16-beat poetry that's known only in the Mani. As a result, he was invited to the Tinos International Literary Festival. "Oh great-- they want me to read my poem!" was Jeff's first thought. "When I get there, it's nineteen poets and moi. They hadn't even bothered to include my poem in their book. I was expected to read something about mystery writing, which leads me to this story I have to tell. I'm proud of it. I defended all us mystery writers! "You have people from all over the world-- basically eastern Europe. I was the only American there. These were good people. I liked most of them, especially the young ones. Some of the older ones were the pretentious 'We are in charge of poetry in Greece' types-- which always appeals to me, that personality type. We go through three days of poetry in Greek and Croatian which is then translated into English. Barbara is bored out of her mind. "I get applause from the younger writers there. The pretentious one stands up and proceeds to spout off in Greek. When it's translated, he's basically told me, 'Who cares what you think? Who cares who kills who? You write something that isn't even literature!' I reply, 'You sir, don't have any idea of what you're talking about. Not one clue. I have one word for you: Dostoyevsky! I'll bet you haven't even read a mystery!' 'Of course not!' 'I rest my case! You don't know what you're talking about! Now go sit down!' To my surprise, that's what he did. He sat down. Afterwards, people thanked me for saying that because the man was so important that everyone was afraid of speaking against him." "I have a kind of variation on that," Hallinan said. "I wrote about a robbery in one of the Junior Bender books in which he has to pick the lock on a door that's in full view of the street. What he does is get a huge Sub Zero refrigerator box and deliver it to the front door. He's cut a hole in the box so that he can stand inside it and take his time picking the lock. I thought it was pretty cute. About six weeks after the book came out, I get a call from the North San Fernando Valley Police Department. 'Who told you about the refrigerator robberies? We've been keeping that detail quiet.'" 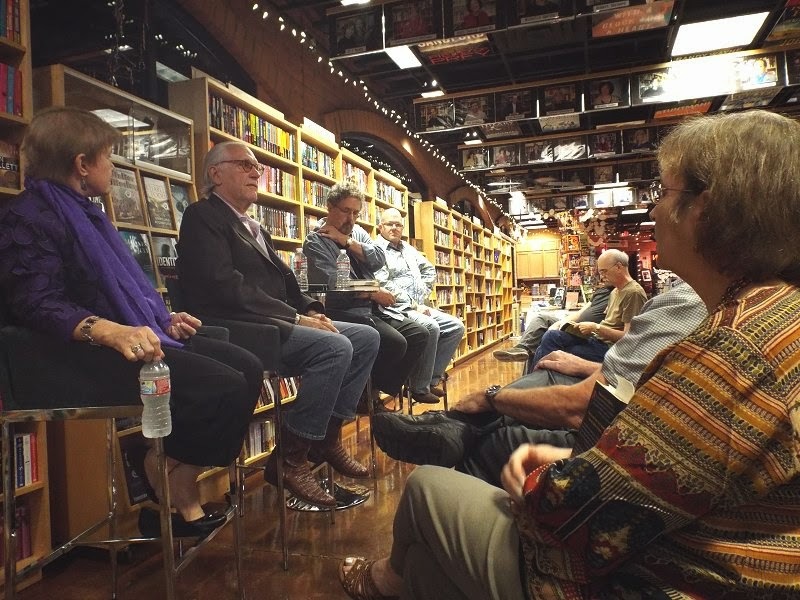 A fan in the audience spoke up, saying that crime writing has become one of the central ways people learn about the histories of various countries, and it's an interesting way to look at an unfamiliar culture. Shortly after that, it was time to get books signed, chat a bit more, and nibble on some delicious cookies. If any of you want to watch the entire event, you can view it on The Poisoned Pen's Livestream channel. Cathy - Oh, lucky, lucky you!!! I've heard both of these guys are great in person, and I would love to have met them. Thanks for taking us along on your trip! They *are* great in person, and I sincerely hope you get the chance to meet them one day, Margot! You got it backwards Cathy, it was Tim and I who had our greatest day thanks to you and Dennis! You make me smile, you silver-tongued devil, you! Cathy, these are not just two of my favorite authors, they're two of my favorite guys. Cathy, I miss the Poisoned Pen so much, so I'm really glad you did this summary. Thank you! And I miss seeing you there, Lesa. Glad you enjoyed my recap!